For the most reliable snow plowing service in Ogden, Utah and surrounding areas, you can always call on us! Wherever snow falls, we can be there to remove it. Residential, commercial, walkways, parking lots, pavements, roads, driveways and more, Ogden Snow Removal has the right tools to get the job done, even before you wake up! Because we have a great deal of equipment in our inventory, ranging from simple shovels to advanced snow blowers, plows, tractors, pushers, etc., we offer the most complete snow removal service around. We use high quality machines and motivated snow plow drivers so we can keep costs low for our clients. We begin plowing right after snowfall, unless the city is expecting heavy snow, in which case we reduce pileup by plowing before inches accumulate. We stay very tuned to weather reports and have drivers on-call for those early AM snowfalls. We pride ourselves in getting snow out of your way so you can tackle the world when you rise! For heavy-duty jobs, such as commercial plowing, we use front-end loaders, skid steers and snow pushers on our large tractors to reduce plow time. 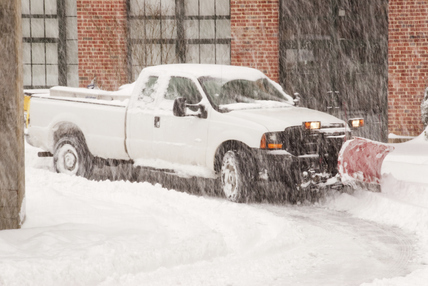 For roads, driveways, walkways, and other small spaces, such as residential plowing, we use a pickup truck or compact tractor equipped with a straight blade plow for most snow removal and/or a V-plow for hard-packed ice, snow and deep drifts. We will always ask you where you want us to pile the snow if you don’t need snow hauling. 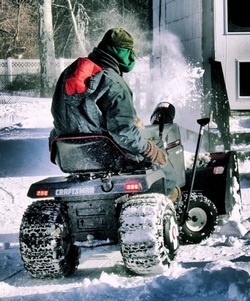 We never pile the snow in high-traffic areas or in obstructive ways such as your neighbor’s yard! If the layout of your land calls for it, we will mark plow areas with tall, thin ground stakes so we can visually detect the plow paths. We are very aware and pay extra attention to areas around curbs, cars, fences, mailboxes and the like so that no damage is caused to your property. Winters can be rough, but they don’t have to be. Ogden Snow Removal would rather you relax and enjoy the beauty of the snow, peacefully falling down and making you feel an internal joy that only comes around once a year. We’ll take care of the strenuous work and do so at an affordable price! Save yourself some hassles with the best snow plowing service in Ogden, UT and call us today, or any day, 24 hours a day at 801-658-9343.